Educator training collars use the lowest levels of "blunt" stimulus to improve behavior and reduce the stress of owning a dog. These are the most reliable and advanced training collars available in the world. Every Educator collar is built to the highest quality standards and is tested to withstand the most extreme environmental conditions. We fully assemble each training collar and test all of our products in the USA. Educator collars use proprietary stimulation that's "blunt" not "sharp". This is less stressful for the dog, while still providing sufficient incentive for the dog to comply with your commands. Educator large dog training collars provide the highest and cleanest stimulation available to control the most stubborn dogs, even in prey drive. Educator has innovated the use of customized low level stimulation to achieve superior training results without placing undue stress on the dog. Our advanced COS (control of stimulation), employed with all Educator products, provides the owner the ability to finely tune the stimulation level for all the different temperaments of dogs. COS improves training results and provides a better training experience for the owner and dog alike. Dogs properly trained with Educator collars typically never vocalize discomfort, jerk their heads or experience the fear of the training collar commonly found with imported collars. The stimulation dial can be adjusted from level 0 to 100 easily and safely, without the risk of over stimulation. The patented "lock and set" feature allows the user to lock in the best stimulation level without risk of accidentally increasing the stimulation. This COS technology is accomplished by our patented voltage-to-amplitude conversion technology employed on all Educator collars. For situations when you really need to get your dog's attention, there's an additional boost feature which provides more distractive stimulation. This boost level is settable between 1 and 60 on most models. 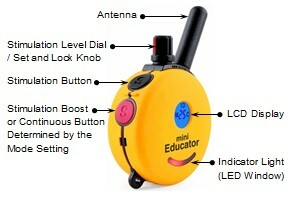 Educator has developed the most reliable and fastest wireless link in the industry. When you push a button on an Educator product, the training collar responds instantly. Only trust the best for your best friend. With its ergonomic "stopwatch" design, you don't even have to look at the transmitter, allowing you to watch your dog at all times. 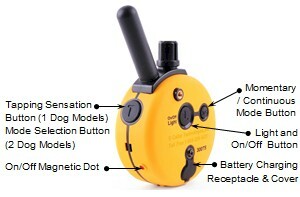 The transmitter also controls a tracking light which allows the user to flash or continuously light up the collar receiver for locating a dog after dark. A beeper can be turned on to help locate a lost transmitter. The waterproof transmitter even floats, so don't worry if you drop it in the lake. The convenient night blue LCD displays used on all Educator products provide the user an easy way of knowing the stimulation level in all conditions.